Welcome Home to this spacious,1600-square-foot, three-bedroom (plus a loft), three-bathroom condo located in the Timber Falls Condominiums. 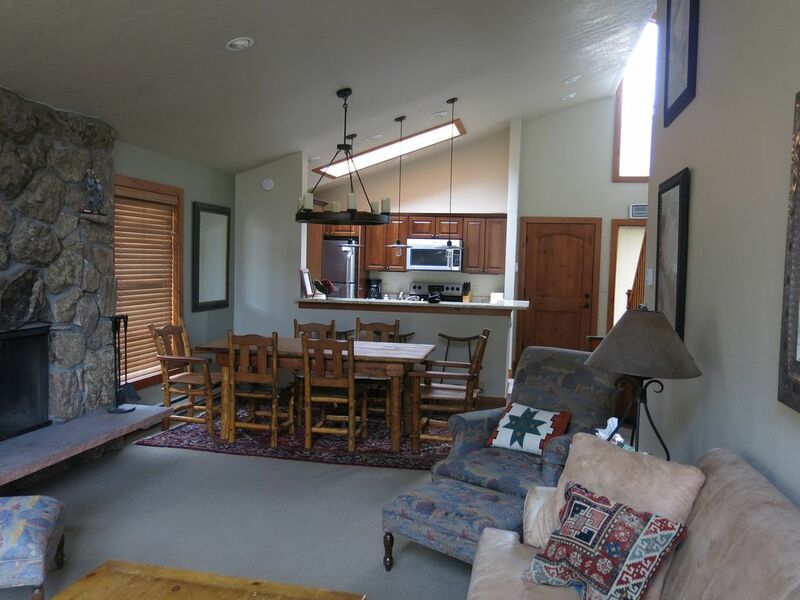 Sit on the back deck and look out at the White River National Forest, relax by the fireplace after a day of activity, sit in the hot tub, or surf the internet. We completely renovated the condo during the fall of 2013 with a new kitchen, new bathrooms, and new carpet. This comfortable, family-owned, vacation condominium is not a part of a rental pool and is used primarily as our second home (only rented a few weeks each year). You deal with owners directly, not a rental agency. Plus, the kitchen is already stocked so you do not have to go to the store for condiments that will go mostly unused. Fully furnished to sleep up to eight people comfortably. Sleeping arrangements include two very comfortable queen-size beds in the master and guest bedrooms (both rooms are 11-feet by 13-feet), a bunk bed with a queen size bed on the bottom and a twin bed on top in the third bedroom(a great room for kids), and a queen-size bed in the loft (10-feet by 13-feet 6 inches). The living area is comfortable and open with a hardwood fireplace, spacious living room, a beautiful dining room table, and a fully-equipped kitchen. We also have a seven person hot tub in the building. It is just down the stairs and is a great way to relax after a hard day in Vail. Only the nine units in the building have access to the tub. Alpine and Nordic skiing, ice skating, hiking, biking, golf, fly fishing, and tennis are all nearby as is the newly renovated Gerald Ford Amphitheater/Vilar Pavillion. Once you arrive there is no need to drive. Leave your car in the parking lot and use the FREE Vail Shuttle with a bus stop 100 yards from the condominium. You are only three and one-half miles or eight minutes from the heart of Vail Village. The condo is owned by four owners (three family members and a friend). We all live in Denver and have loved skiing at Vail our whole lives. We love getting up to Vail as much as possible but two of the owners have small children so the trips are limited. We love our place every time we visit. Vail has always been our favorite place. Nothing beats the back bowls. We love Timber Falls because of the views from the condo and the fact that is it far enough from the highway that you don't hear the traffic noise that is common in East Vail. Easy access to hiking, one of the first stops on the Vail Valley free bus route so we always get a seat and we always get on the bus (even during the busy weekends). The Hot Tub, the view off of the back porch. Great location! Easy to get to the village on the bus! Lots of space, handles 8 adults easily! This is our second time renting this unit! It comes with everything you need for a comfortable stay! Easily handles 8 people. Love the convince of the location and the ease of getting to town on the free bus. Jeff the owner is very prompt in answering questions and we had everything we needed for a great ski weekend in Vail! Will definitely rent again! Location is perfect and Jeff is very easy to work with. Condo is very comfortable with nice beds. We had a few questions beforehand and during our trip and Jeff quickly responded. Thanks for your kind words. We are glad you enjoyed the condo. We also appreciate your help with some cleaning before you left. I appreciate that you were in contact with questions to help improve your stay. Let us know if you get back to Vail. Wonderful place to stay. Easy to get around Vail. The condo was very spacious, even more than anticipating. Thanks for a great weekend! Thanks for your nice review. We agree that the condo is very spacious. Thanks for taking care of our second home. We love it up there. Great location, beautiful area, quiet-just what we needed. Walked in and felt at home. Location is really everything. Right on the bus route and easy to get to. Would definitely come back. Our group of 8 (adults) fit perfectly into this condo. Every one of the rooms was comfy and well furnished, and looked even nicer than pictured. We enjoyed an evening of cooking in the well-equipped kitchen and, with the help of a pull-up stool, all fit at the table. We didn't try the fireplace but the living room was roomy and the balcony a great perch for watching one night's meteor showers. It was an easy 5 min. drive to a food market and 10 min. to Vail. My 80-year-old parents did have a hard time with the two steep flights of steps (didn't think to ask what floor it was on) but I imagine that wouldn't be a problem for most people. We would definitely recommend this place in any season. Love to try the fireplace and hot tub in the winter! Thanks for your kind words. We have rented a few VRBO places for our vacations and we always appreciate when the staples are provided. I am glad you enjoyed the deck. That is one of my favorite views. We appreciate you taking good care of our condo and hope to see you back in Vail. We found this condo to be well appointed and comfortable. The owners were friendly and accommodating the setting was great. The pool was a couple minute walk away, but we had a great time utilizing it. Vail Village was a short drive away, but we enjoyed our time there as well. I believe there is a shuttle as well but we did not utilize this. Overall we had a great experience and would consider staying here again if we returned to the area.